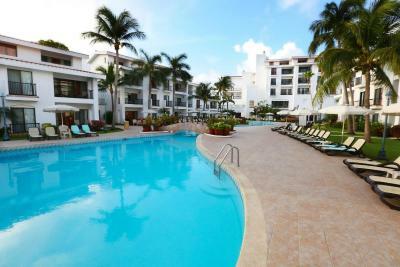 Lock in a great price for The Royal Cancun, All Suites Resort – rated 8.7 by recent guests! Great for kids. 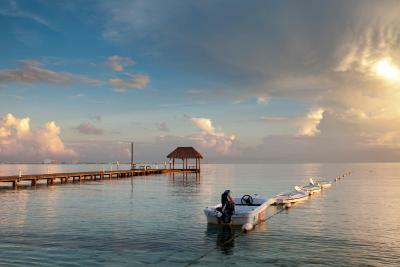 Isla Mujeres creates barrier allowing calmer beach for young kids. Can still go to the other properties for more traditional wave action! Great beach for children as it is very calm and shallow. Staff was friendly. Location! This is a smaller villa resort. Very lovely. Directly on a quiet beach which is very shallow sand great for El Niño’s swimming! 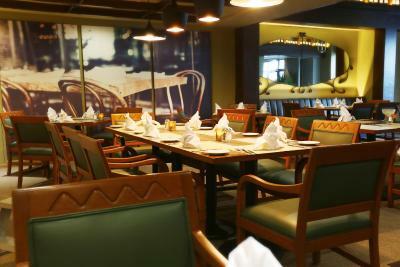 It’s very well maintained with excellent staff. 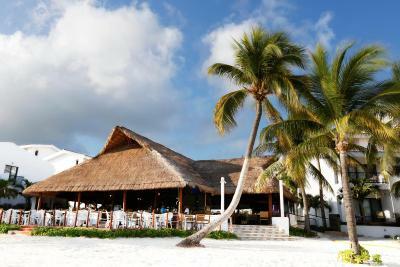 The restaurant is right on the beach and very good. Many kids activities and nice pools. No roaming packs of drunk people! It’s a great family resort! The staff are outstanding in every way. It’s very safe as well. Will be back soon! The staff were absolutely wonderful. They went out of their way to help when we would ask a question. The restaurants were fantastic and reasonable. The views from the room were amazing. Just love this place!!!! 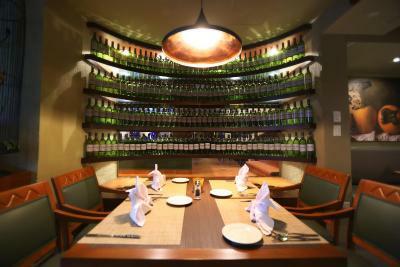 The staff is very accommodating and service-oriented. They really want to make sure you are enjoying your stay. We recognized and appreciated all their efforts! I liked the overall space it was me and four of my friends for my 24th bday it was spacious the kitchen was nice. Vanity area was very spacious. 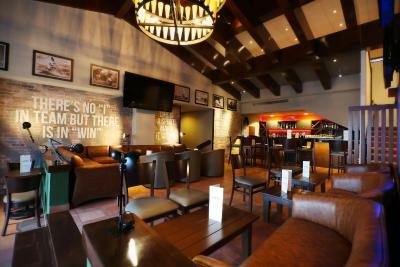 the staff is really nice and the air-conditioned worked exceptionally well. Nice big clean room everything in kitchen you need. Clean beach, pool, and grounds. Friendly staff. Right on the beautiful beach. Many palm trees and flowers. Calm beach area and saw some wildlife right there. 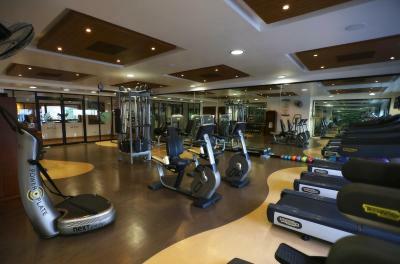 Easy to access activities and friendly staff. 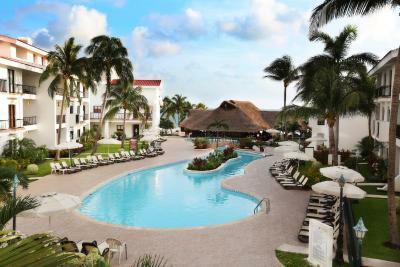 The Royal Cancun, All Suites Resort This rating is a reflection of how the property compares to the industry standard when it comes to price, facilities and services available. It's based on a self-evaluation by the property. Use this rating to help choose your stay! 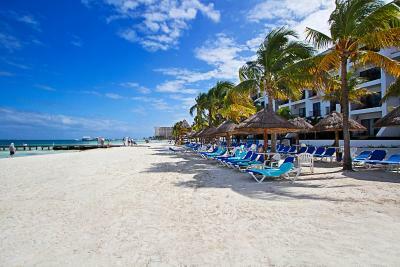 One of our top picks in Cancún.The Royal Cancun® All Suites Resort is nestled on a sheltered beach on the north shore of the Cancun Hotel Zone with breathtaking views of the bay and Isla Mujeres. Free high speed WiFi is available throughout. All rooms have kitchens fitted with a fridge, cooker, dishwasher, microwave, coffee maker and toaster. A living area with a pull-down Murphy bed, a dining area and a private open-air terrace for sunbathing and open-air dining are offered. Suite amenities include central air-conditioning, TVs, DVD players, telephone, in-room safe, hair dryer. All the suites are Non-Smoking. 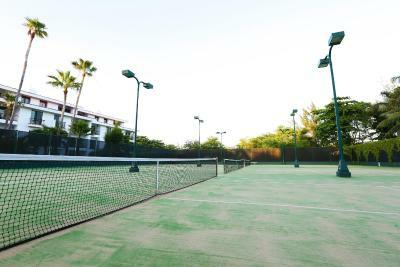 The resort offers two free-form pools, tennis courts, gym, beach massage service, a mini market, bicycles, sailboats, travel agency, car rental and an activities program for children and adults. 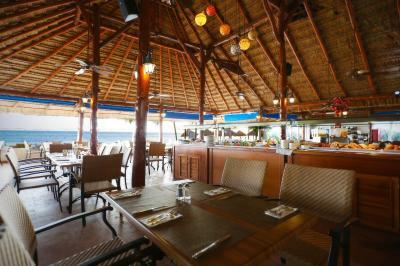 Enjoy La Palapa beachfront restaurant, The Italian Trattoria and Sports Bar, pool bars, express take-out food counter pizza delivery and room service. 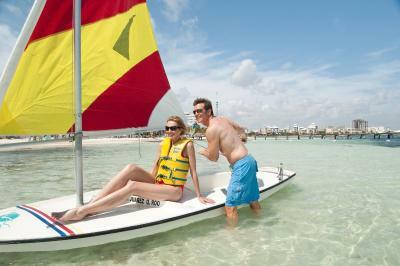 A complimentary guest shuttle bus between other Cancun Royal Resorts is available. The resort purifies its own water. 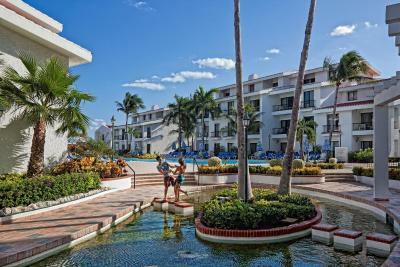 Enjoy our fine dining, activities and many other amenities with the All-Inclusive package or the European plan. There is a golf program with discounted rates at several local courses and guests can sign up for the weekly Royal Resorts golf tournament. 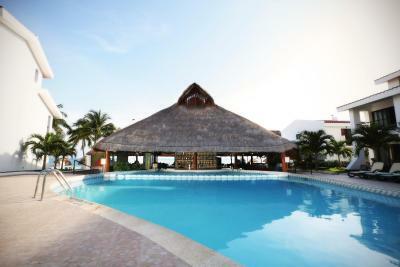 This property is also rated for the best value in Cancún! Guests are getting more for their money when compared to other properties in this city. 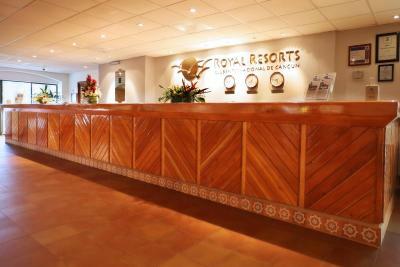 When would you like to stay at The Royal Cancun, All Suites Resort? 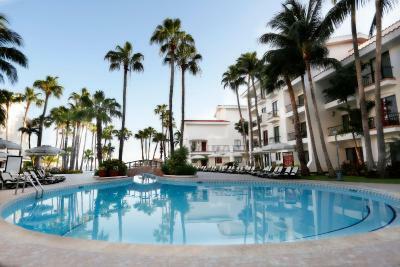 The suites have a king size bed, a double Murphy bed and two single beds and open to a balcony with views of the bay looking to the pools and gardens or of the Nichupte Lagoon. The pillow top bed is dressed with premium bedding and a down duvet. The private bathroom has a shower/tub combination, as well as a hair dryer and a makeup/shaving mirror. A 32” LCD TV and CD player are offered for your entertainment. The in-room kitchen includes a full-sized refrigerator/freezer, a stovetop, oven, dishwasher and a microwave. 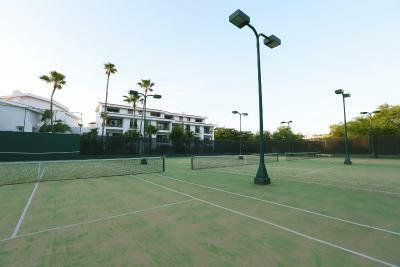 Air conditioning and a separate living room are among the conveniences offered. 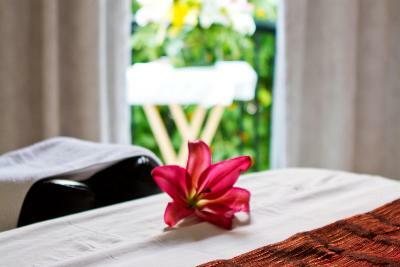 You can request an in-room massage. This room is Non-Smoking. Enjoy fine dining, activities and many other amenities with the All-Inclusive package or the European Plan (no meals included). Complimentary high speed WiFi is available for all guests. 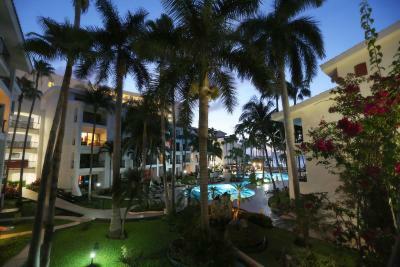 The split-level two-bedroom, two-bathroom Master Suite has a king size bed, a double Murphy bed and two double beds and open to a balcony with views of the bay looking to the pools and gardens or of the Nichupte Lagoon. The pillow top bed is dressed with premium bedding and a down duvet. The two private bathrooms have a shower/tub combination, as well as a hair dryer and a makeup/shaving mirror. A 32” LCD TV and CD player are offered for your entertainment. 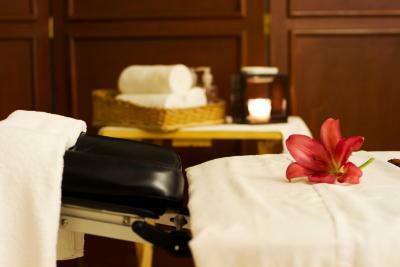 Request an in-room massage. The in-room kitchen includes a full-sized refrigerator/freezer, a stovetop, and a microwave. 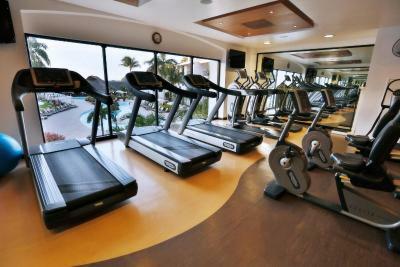 Air conditioning and a separate sitting area are among the conveniences offered. This room is Non-Smoking. 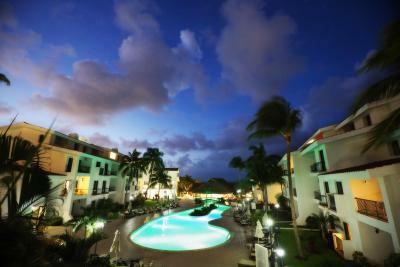 The suites have a king size bed, a double Murphy bed and two single beds and open to a beachfront balcony overlooking the Caribbean Sea. The pillow top bed is dressed with premium bedding and a down duvet. The private bathroom has a shower/tub combination, as well as a hair dryer and a makeup/shaving mirror. A 32” LCD TV and CD player are offered for your entertainment. The in-room kitchen includes a full-sized refrigerator/freezer, a stovetop, oven, dishwasher and a microwave. Air conditioning and a separate living room are among the conveniences offered. You can request an in-room massage. This room is Non-Smoking. This suite features a balcony, DVD player and CD player. 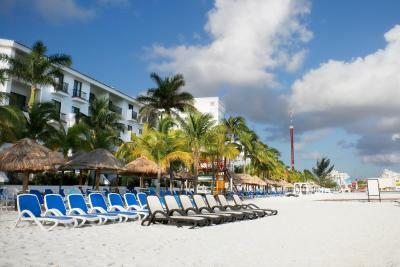 The Royal Cancun is located on a privileged beach surrounded by a relaxing atmosphere. 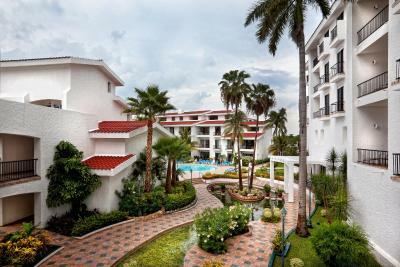 Enjoy our fine dining, activities and many other amenities with the All-Inclusive package or the European Plan. 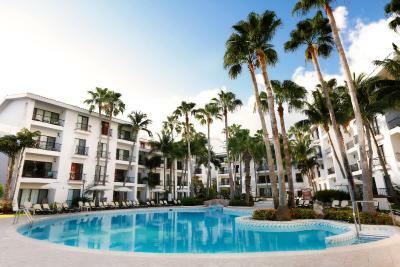 Offering 201 fully furnished suites. 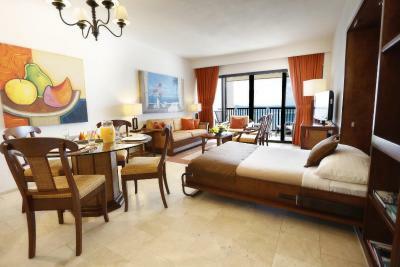 House Rules The Royal Cancun, All Suites Resort takes special requests – add in the next step! 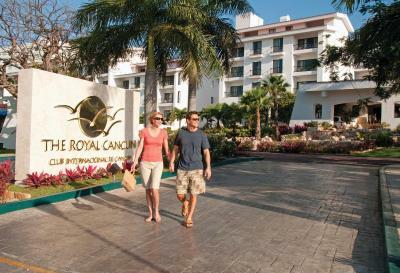 The Royal Cancun, All Suites Resort accepts these cards and reserves the right to temporarily hold an amount prior to arrival. 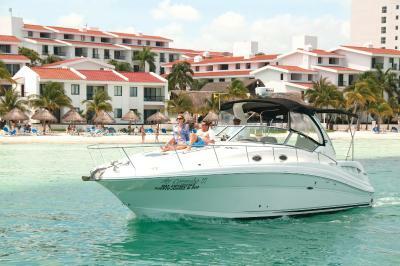 All reservations will be subject to the payment of an environmental tax, the cost of this tax will be MX $48.36. 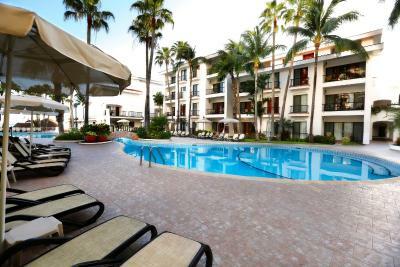 Prices are in Mexican pesos and per night payable directly at the hotel reception at the time of check out. Please note that for guests’ stays crossing a Saturday night a room move might be required. Should this be the case, our management team will assist our guests in order to make this an uneventful process. 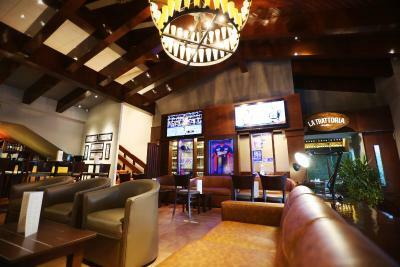 Your reservation charge will appear on your credit card statement under the name of: ROYALRES or Royal Reservation, Ft Lauderdale, FL - USA. Please contact the property with any questions regarding the charge for this reservation. A security deposit of USD 500 is required upon arrival for incidental charges. This deposit is fully refundable upon check-out and subject to a damage inspection of the accommodations. 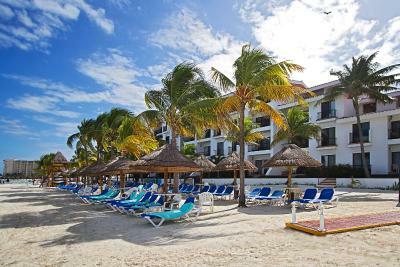 o	Accommodations, dining, beverages, snacks, soft drinks and selected alcoholic beverages, 24-hour room service. Daily Maid Service provided. 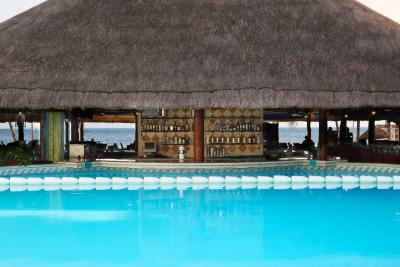 The resort was very busy during our stay and as a result areas around the pool could have been cleaner sooner. I love the layout of the 2 bedroom villa for our family. It is spacious and clean. The view from our beach front villa was truly exceptional. 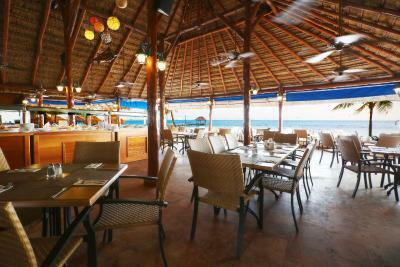 We love the nightly themed dinner features at LaPalapa; Lobster Night, Prime Rib Night, Shrimp Festival, etc. The kids loved their time spent in the Kids Club. All of the staff are pleasant and helpful. 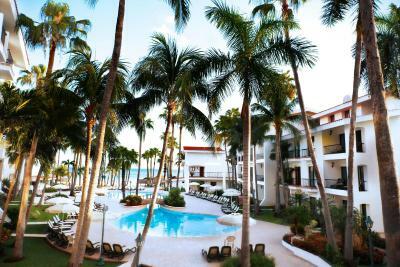 It truly felt like a vacation as every detail is taken care of including laundry service. Very few food options on-site. Also, the room card requirement when all-inclusive is a pain. The buffet this year vs prior year was not very good. Family friendly resort. Great attentive staff. There was a lot of seaweed on the beach. Some of the front desk staff struggled to understand our requests. Watered down drinks, surcharges for better liquor and better food, slow service at restaurants. Will not return. Could use a bigger kids playground. 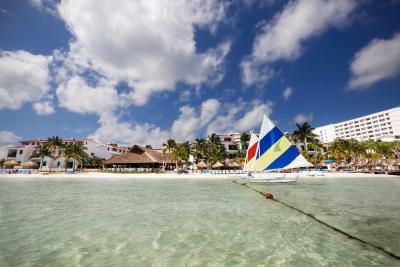 This is not specific to the hotel, but Mexico, this area included, is not the safest, thus you are bound to organised trips to avoid risks. Guards with walkie-talkies are everywhere, patrols, police and private security. Nothing special outside of resorts, by the way. Moreover on the climate, it's very humid thus you need to keep your AC going, which in our room was rather loud. Keep in mind, beachfront rooms are exposed to very noisy parties on pirate ships departing the nearby port every evening, and passing by very closely. Extremely helpful, polite and attentive staff. Felt safe and cared for. 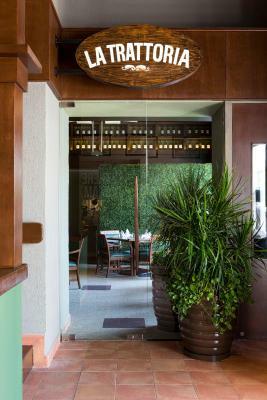 Super fantastic local foods, flawless service, great waiters, Very clean, tidy and well laid out resort, cozy in contrary to huge tower-block hotels in the area. A place to relax to the fullest. Great small shop on the premises. 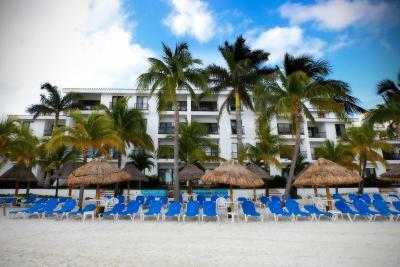 Reasonable prices, not much push for timeshare membership, you refuse once and they leave you alone. Could have stayed in our week 51 unit on the 21st. Would have saves some housekeeping. Sent my parents to the hotel, in order to spend a night there before going home to Belgium and as my parents didn't speak any English nor Spanish, had a really bad experience with the crew. The price was higher than my booking on booking.com (considering the taxes etc), the crew was really not nice (I had to arrange everything on the phone for my parents, as I can speak Spanish and the conversation was pretty much like this (considering a long journey for my parents with my little sister of 11 years old and the time of 8.30 pm at that moment, after spending 15 minutes in the hotel) : "if your father doesn't pay what I say in the next 10 minutes, they will be asked to leave and look for another place to stay tonight"). After I asked my father to accept and pay what was required (too tired looking for a greater place to spend the night), they were treated like enemies and I had to call once again because after paying 320 USD for one night and 200 USD of the deposit (never none deposits were announced on booking.com) they were charged for all the basic food in the restaurant when it was supposed that everything was included (in fact the lady at the reception omitted to put a bracelet on their hands). I also had to call once again to reclaim to have a receipt (as a part was paid in Mexican pesos, cash) because it was never given. Pool is missing kids features such as slides and water games. Rooms could be remodelled to be more modern. Reception never answered my email request for transportation to/from the airport which made us have to pay more for the shuttle. 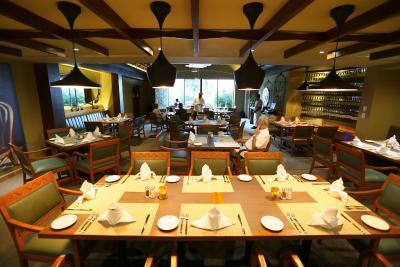 The food provided as part of the all inclusive option offered a good variety and quality. The resort staff was very friendly and welcoming. Free activities provided for kids and free water equipment including sail boats available. We had our beachfront suite with stunning view and patio walking out straight to the beach. Large 2 bdrm suites, bigger than condo size in Toronto. friendly staffs, room/hotel always kept clean, prices are decent in grocery store and restaurant, no need to venture out.